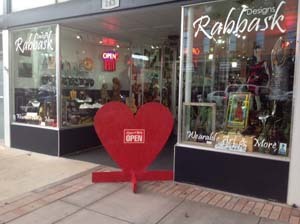 Show windows filled with artisans’ jewelry and other handmade art draw shoppers into Rabbask Designs in Loveland, Colorado. Owner Jacki Marsh is a passionate supporter of activities and policies that bring vitality to Loveland. No surprise that she chose a heart , the symbol that residents embrace with pride, to sit outside her door. To me, now that I know some of Jacki’s story, the heart has multiple levels of meanings. There’s her love of dogs and horses. Two elderly rescue dogs lumber from resting spot to resting spot at the back of the store, where photographs of beloved horses decorate the walls. There’s her love of art . . . her desire to share it and to help other artisans longing to share their passion. Finally, there’s the true story of her heart that almost gave out on her and in doing so put her on the path to Rabbask Designs. Rabbask. A’s are pronounced ah, accent is on the last syllable. Let’s follow Jacki’s story backwards, starting with today at Rabbask Designs, which celebrated its first anniversary on October 25. The window sign “Wearable art and more” means what it says. Local artisans and artists have dropped by with their work during the past year, and Jacki has taken it in, mixing a variety of art forms in with the wearable art that had been her original plan for the shop. 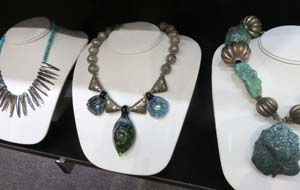 In the show windows, art glass and bronze sculptures intermingle with an array of unique necklaces. At Rabbask Designs in Loveland, Colorado, wearable art takes center stage; but fine art and handcrafted items of all sorts are on display. Inside, a long rack of women’s clothing splits the store in half front to back. Some pieces are handmade, including a section by Roxanne Storlie; all are unusual and appeal to a woman’s artistic sensibility. Visible above the rack, high above the back counter, silk scarves by artisans Abbie R. Powers and Sheron Rowland float in the light breeze of a fan. Creative purses and other bags made by Heather Rubald from fused layers of plastic sacks currently occupy the left front corner of the store. 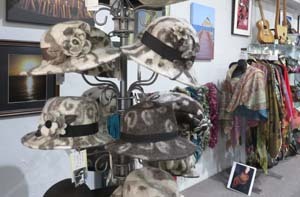 Beyond them, felted wool hats by Mickey Ramirez, who raises the sheep the wool comes from, hang on a free-standing rack. Scarves, more clothing, and colorful Rock Spring shoes (handmade abroad) line the wall beyond. Felted wool hats by Mickey Ramirez foretell the winter season at Rabbask Designs in Loveland. Handmade wooden instruments and more art glass occupy shelves above them. And higher yet hang a variety of paintings and photography. Islands with multiple shelves of necklaces fill the floor space at the back. More jewelry lines the east wall on shelves and in show cases, including pieces by Gary Hixon. Rabbask Designs has a necklace for every shopper’s price range, from $15 into the $1,000s. 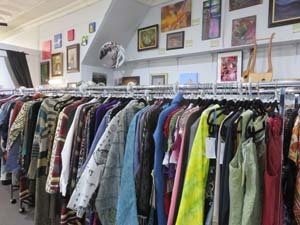 Altogether, the store carries the work of more than 60 artisans and artists along the Front Range. That includes Jacki herself, who makes extraordinary necklaces with beads of hill tribe silver from Thailand, prayer boxes from Afghanistan, 100-year-old beads by Yemen silversmiths, and numerous other beads, metals, and stones with interesting histories. Necklaces by Jacki Marsh of Rabbask Designs include beads, stones, and pendants from around the world — and from artisans on the Front Range of Colorado. When Rabbask Designs opened a year ago, necklaces created by Jacki made up most of the merchandise. She had been making jewelry for a decade, placing it successfully in galleries around the country. But she had become disenchanted with that sales mechanism for several reasons and wanted a place where she could sell her jewelry herself. Early in 2013 she spotted the building at 243 East Fourth Street in Loveland. It was neglected and in disrepair, but Jacki knew right away that this was the place to take a new turn in life. She eventually purchased the building, where she established a store at street level and a home above. In 2002, making jewelry and selling “wearable art and more” was far from her dreams. What Jacki loved was running competitively. Thirty years earlier, she had won the first Crazy Legs Half Marathon, the only six-mile race for women at the time. (The annual race now draws 6,000 competitors internationally.) Jacki had run whenever she could. However, a degenerative heart disease gradually sapped her energy and for a while left her waiting to die. In 2003 she was evaluated for a heart transplant, but she was ruled ineligible because she had more than six months to live. Silversmiths in Yemen made and signed the beads in this necklace over 100 years ago. The pendant is an antique bracelet also from Yemen. 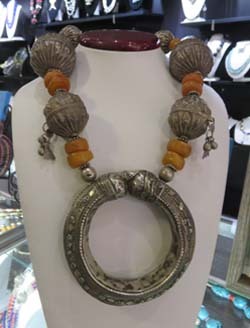 Amber stones worn a century ago in Morocco complete the look of this piece by Jacki Marsh of Rabbask Designs. That year she dropped in on a friend in California who had suddenly found herself in an extreme financial crisis. A successful jewelry maker and shop owner, the friend needed money – plenty of money – fast. Though she had little personal interest in jewelry, to help out, Jacki bought her friend’s entire collection of rare and exotic beads at a well-discounted price. Languishing at her California home with little she could do, Jacki began to toy with arranging the beads and making necklaces for the first time. Friends were impressed with the results and encouraged her to place her work in galleries. Jacki had rolled her eyes in disbelief, but before long, the prestigious Conway of Asia accepted her work. She learned about the history of her beads from experts she met and fell in love with the culture and origins behind them. Jacki had found a new direction, and her heart got a second chance too. A new pacemaker that synchronized the action between the two sides of her heart gave Jacki energy she hadn’t enjoyed in years. Meeting her today, vibrant and full of laughter, you would never know she had spent years struggling to live, sometimes waiting to die. 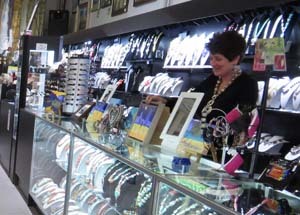 At her shop Rabbask Designs, Jacki Marsh offers a wide variety of necklaces made by herself and other artisans. You can meet Jacki yourself during store hours almost every Monday through Saturday. Rabbask Designs has generous weekday evening hours for those who want to come by after work. Check its “about” page on Facebook for exact times. It’s open Sunday, too; Heather Rubald, who makes recycled handbags, usually minds the shop for Jacki that day. Jacki likes to keep the shop lively by offering live music frequently; and she periodically schedules demonstrations by artisans whose work is for sale there. Follow Rabbask Designs on Facebook to stay abreast of activities and new things for sale. This entry was posted in Jewelry, Shops and tagged Jacki Marsh, Loveland, necklaces, Rabbask Designs, wearable art on October 29, 2014 by Sally.